I'm going to be brutally honest with you, dear reader. You may not like what I have to say, but I do request that you read this article and do me the honor of thinking about my opinions and evaluating them for yourself. You owe that to any animal you might choose to bring into your home. Any responsible pet owner knows to do some research into what the needs of their new animal will be; this need for research is greatly magnified if you are considering something other than a "traditional" pet (i.e. a cat or dog). For the sake of brevity, I will call non-traditional pets "exotics," even if they are indigenous to the country. Every animal has its own instincts. Many undesirable ones have been bred out of them over millennia so that they will make good companions for humans. Dogs are an excellent example of this. Humans and dogs found a mutual need in each other and the relationship has worked out well. Dogs tend to obey us, behave, and generally be a good addition to a family, should a family decide that a particular breed of dog is suitable for them. However (and this is where you may start to disagree with me), exotic animals have not had thousands of years to become acclimated to being pets. I can give two very good examples, as I own two exotic animals. 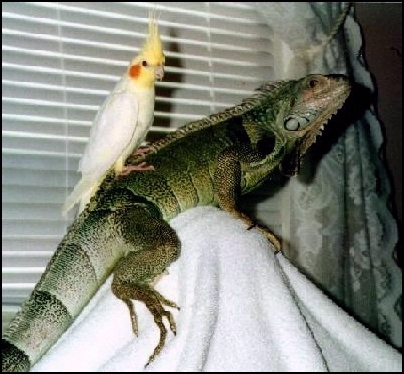 An iguana is very good at being an iguana and a bird is very good at being a bird. When I first got these animals, I was not as educated as I should have been. My first iguana died (as most do), but my second one, Rosebud (the infamous "lostlizard") is healthy and strong and does exactly what a male iguana is supposed to do. On the surface, he seems like a plant with feet that only eats, poops and sits under special lighting to digest his food. Being male and mature, some instincts kicked in, and he began to become territorial; this almost cost him his life. I don't keep him in a cage, and he chose the bathtub as his "special space." He hung out there for almost a year (yes, he learned how to climb in by himself and no, I don't know why he chose a cold bathtub as his domain), and I merely thought it was cute. I didn't pay attention to his behavior as I should have, and he slowly became more and more aggressive when I went into the bathroom. One day, I took him some food as a treat and placed it in the tub for him (keep in mind that he had NEVER been nasty towards me in his entire life�this five foot reptile even sleeps with/on me occasionally). He didn't seem to want his treat, I turned my head for some reason and the next thing I knew, he had lunged out of the tub and attacked my head. Luckily for me, he just got a mouthful of hair. I was shocked beyond belief, pulled the hair out of his stomach with forceps, and immediately took him to the vet to get him out of my home, as I couldn't trust him after his doing something so drastic. This monster reptile had aimed for my cheek, and I barely escaped having plastic surgery on my face. I couldn't be mad at him, as he was doing what nature intended him to do�defend his territory. Iguanas are not meant to be pets, they are wild animals, no matter how much we think they may be domesticated. After a few days in iguana jail and daily visits to him, I could see that he was not going to live there, there was no place for him to go, he was withering away at the vet's and I had to make a difficult decision�was I going to put this magnificent animal to sleep because he had the potential to be dangerous, or would I examine his behavior patterns and try to find out how I could accommodate him so he could come home? By the time a home MIGHT be found for him, he would have died from the stress of being in a chaotic environment. I chose to take the risk of his attacking me again, decided that if he was kept out of the bathtub he would probably be okay, and brought him home again. I have been lucky, as he has been an angel since he has come back, but it made me think carefully about what I got myself into. My curtains are ruined, as he likes to climb them, he knocks everything off my dresser in order to look in the mirror, and I have to have a constant supply of a wide variety of fresh foods for him to eat. Honestly, he eats better than I do and the thrice-weekly trips to the grocery store get expensive and time-consuming. A plate of all this food must be prepared for him EVERY DAY, no matter what. He needs special lighting and heat. I have no special place to put a giant iguana, so I choose to respect his requirements for room to roam and let him have the run of my apartment. Iguanas are not meant to live in cages, they are meant to live in the tops of trees. To keep him in a cage is cruel and would only fuel the image that I have him because he is a "vanity pet." I love lizards of all kinds and would like to have another, but I know I can't accommodate one, nor do I wish to perpetuate the exotic pet trade when I don't have the facilities for another (and I'm not sure I have the proper facilities for the one I have). Exotic animals belong in the wild or in an environment where their natural habitat can be mimicked. I have done my best for Rosebud, and he seems to be thriving, but should he attack me again, I will have to have him put to sleep�he is potentially dangerous to me and to anyone who might own him. There is no refuge for huge reptiles and he can't be released into the wild. My second story of the difficulty of owning an exotic animal regards my beautiful cockatiel, Jarvis. I have learned that some birds (especially parrots, which are very, very intelligent) bond with either another bird or their owner. Luckily, I work out of my home and can be with Jarvis almost 24 hours a day. She is not confined to a cage, she does not have her wings clipped and can fly, she screams every morning at daylight, and she is allowed to sleep with me if she wishes. Despite being spoiled rotten and given the best home I can possibly give her, it's not enough. She can't get enough of me and I feel guilty when I shoo her off my head 20 times during the night or when I have to clip her nails (this is VERY stressful for any bird). It breaks my heart to see how she has mutilated herself by plucking the feathers under her wings, a habit that she will never stop, no matter what I do for her. I can't think of a better way to care for her, but she is still stressed somehow. Again, she belongs in the wild or in a large aviary in a zoo. These are just two example of what can happen to exotic animals when we decide that it would be neat or cool to have one. An exotic animal is not a good way to express your personality unless you are prepared to make the commitment to give them what they need. The cute little prairie dogs for sale at pet stores need to dig and live with a group of other prairie dogs; buying one and keeping it in a cage is cruel, mean and heartless. Ditto for the large parrots or pot belly pigs. Unless you can provide an environment where ALL of their instinctual needs can be met and you can accept the consequences of these needs, don't buy an exotic pet. Leave them to the responsible breeders who will only sell them to responsible pet owners who can make the commitment for life (and beyond) or to the zoos. Granted, without some breeders and zoos, we would be witnessing the demise of many species of rare animals. However, if you think that having a "different" animal would make you seem cool, spare the torture you will inflict on a living creature and find another way to express your individuality; go pierce a body part, buy a sports car, dye your hair, do anything that won't infringe on the life of an animal that cannot speak for itself. You'll soon tire of your pet, and it will be sold or given away over and over again until its death. Animals bond to their owners and they don't understand why you get rid of them. This "revolving door" of pet ownership is extremely stressful for the animal, just as it would be for a small child. We all cringe at the thought of kids going from foster home to foster home, but we think nothing of doing the same thing to an animal. There aren't enough refuges to take in the unfortunate animals which get caught in this cycle or get abused. This article is critical enough without recounting many details I have personally witnessed of such things. Do yourself and any pet a favor�don't get it unless you are 110% committed to their care, their needs, and the possibility of their living longer than you. If you can't do this, then go get a tattoo of whatever animal you think you want and be satisfied with that. If you think that tattoo gets annoying after a few years, be glad you didn't get the real thing. Leave the exotic animals to the few people who can handle them.